"Developing this body of yours in which resident speech hearing, sight and on which there is the mind." "This is how we stand in relation to emotions, which binds us or frees"
Yoga arose in India since time immemorial. The oldest traces have been found during archaeological excavations in the current Pakistan on sites dating from about 2500 BC. Therefore it falls deeply in the cultural and philosophical heritage of Indian traditions. Originally, science, art and philosophy of Yoga have developed as spiritual disciplines. However, its followers quickly discovered that it was also a source of health, calm, inner peace and harmony with the environment. Explaining the combination practicing both spiritual, intellectual and physical or … simply gymnastics that will divert our Western minds. Yoga is a discipline of body and mind. The word yoga comes from the Sanskrit root yug which means uniting. The union can overcome any opposition to humanity. Yoga offers a discipline for finding this unity through self-control. From what can be understood, a yoga session consists of putting yourself in numerous positions (postures or asanas) following the teacher’s instructions especially for the breathing rythms. Thousands of them exists within 84 are mostly important : standing, sitting, lying on the back, lying on the stomach, on the knees, etc …. Many of them have animals or natural elements names often filled with symbolism : lotus, cobra, grasshopper, tree, camel… Each one of them have multiples variations allowing the beginners to graduate their efforts from a session to another. The practice of yoga is never about “forcing” or trying to be acrobatic. All the work of the postures consists in stretching exercices rythmed by the breathing movements indicated by the teacher. With his voice, he directs the students with precision, softness but fermly in the practice of the asanas, the pranayama and relaxation, which are the 3 key points of a good Yoga session. The student’s work consists of trying to take the requested position controlling his breath, focusing on the body’s work and figuring how to get rid of the inside tensions. This is how the student will take most benefits from Yoga, each breathing posture and technic having specific results. Within the posture, man rediscover harmony with nature, with his own nature, it will feed his inspiration and creativity. Nevertheless, Yoga is not only a postural discipline but a direct, immediate and positive method to develop the body and spirit in an harmonious way in every daily tasks. In this progression all the components are linked, accomplishment’s desire being the direct cause of the practice. A false interpretation of this law leeds to a partial development, for instance a physical development with a lack of the mental and spiritual aspect. 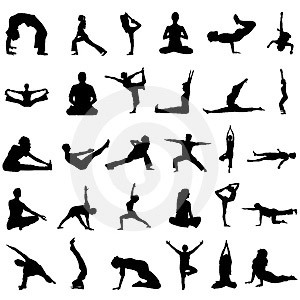 The word Yoga is used mainly in two different meanings : one concerns the aims and the other the ways. There’s a close link between them, the vocal Yoga being used for the ultimate aim of life. To reach this aim there are different methods. Yoga is also used to define the methods to this aim. Yoga finds it’s root in the Sanscrit word “yug” wich has 3 meanings : the first means union, the second control and the last one, “samadhi” translated by integration. Within the word Yoga is the idea of balance for Yoga is the integration of personality. Yama and Niyama : it is the training to behaviors such as social vertues often compared to the 10 commandments. Asana : Is the set of postures allowing body and mind stabilisation. Yoga is based on the notion that it’s from a physical work that occures the psychological transformation. Despite their popularity, asanas are often mistunderstood. Yoga posture is too often considered as a basic gym exercise. All yoga exercise requests a minimal energy expense. No Yoga practice can only be physical nore does Yoga practice can only be cerebral. Every practice is by nature psychosomatic. Pranayama : They are the breathing technics improving control on the autonomic nervous system. The main idea of pranayama is not to control breathing but the control of brain activity. Pantajali’s Yoga sutra’s are very clear on this point. Pranayama’s practice brings to concentration ability. Controlling emotions is more important than controlling breathing, which is only a way to reach this aim. If you are emotionally destabilized, you should try to breathe slowly and deeply and you will notice an immediate change. Yoga is composed by various technics which the disciple has to gradually and regularly practice under the qualified direction of a teacher. But all these technics leed to a unique goal, the integration and harmonious development of the person.